Founded in 1976 and located in Hampton, Iowa, Seabee has been providing some of the world’s largest equipment manufacturers with hydraulic cylinders and engineered solutions for over 30 years. We are a fully integrated cylinder manufacturer, we have the capability to offer chrome plating and specialty steel castings to a wide array of industries. Seabee offers a wide spectrum of value added services for our customers. We can build to your exacting specifications or custom engineer a design to meet your application needs regardless of the volume. With capabilities to build cylinders up to 30” in bore diameter, pressure ratings up to 10,000 psi and single stroke lengths of up to 420”, we are the industry experts in large and long cylinders. Seabee is customer-focused and concentrates on providing cost-effective solutions by working closely with the customer one-on-one. 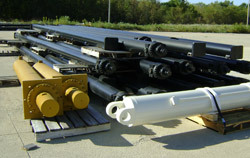 Primary Products: Custom designed hydraulic cylinders for various applications from Agricultural to Waste Management. We specialize in cylinders over 120" stroke with bore sizes up to 30". Manufacturing Philosophy: The cylinder facility is designed and operated to maximize efficiency, using cells and flow manufacturing. Three production lines are dedicated to manufacturing tube and rod weldments for long-stroke, short stroke and large-bore products. Raw materials flow from our warehouse through manufacturing into assembly, test, paint and ship. Pistons, heads and other components are manufactured in cells and delivered to the assembly area for final production.